Novation’s SL MkIII is a big departure from versions one and two that came before it, and most other MIDI keyboards on the market, because it’s not just a DAW and Hardware instrument controller, it’s also a standalone 8 track MIDI, USB and Control Voltage Sequencer. The idea behind the SL MkIII is that all three – the DAW controller, the Hardware controller and the sequencer – sit behind one interface and blend together into one control center. That kind of integration has the potential to change the game for what is expected of a DAW or MIDI controller. Does the SL MkIII deliver? Let’s check it out. In the beginning, MIDI keyboards were simple black and white keys with a MIDI DIN output designed to control hardware MIDI sound engines. Over the years these controllers have evolved, and the SL MkIII is Novation’s attempt to consolidate as much of that evolution in one place. On the SL MkIII, that one DIN output has grown to two DIN outputs, MIDI over USB, and two sets of note, gate and mod control voltage outputs, as well as a clock output. The biggest change though is the on-board smarts, with the inclusion of an on board sequencer and arpeggiator. The sequencer has eight polyphonic tracks (or parts, as Novation calls them), and allows up to 8 lanes of parameter or motion sequencing. The SL MkIII has varying degrees of integration with Ableton Live, Pro Tools, Cubase, Logic, Reaper and Reason. In this review and accompanying video I focus on the integration with Ableton Live. Finally, another way we’ve seen controllers get smarter is to have the ability to load up pre-configured hardware templates, so that you don’t need to map knobs to the right channels manually. The SL MkIII lets you hold in memory 64 of these hardware configurations, and it’s quite easy to create more using Novation’s Components Software. Each template can contain a custom configuration for 16 encoders, 16 buttons, 8 faders, 16 pressure sensitive pads, the mod wheel and three hardware pedals. The keyboard has two modes – it can be either dedicated to one part, or split up into zones to control multiple parts or instruments. The 16 pressure sensitive pads front and center have multiple functions. If you’re controlling Ableton they’re a view into its session grid. With the GRID toggle button they can behave as pressure sensitive pads. When you’re sequencing, the 8×2 grid lets you control either steps, patterns, or sessions. The SL MkIII’s basic sequencing unit is a pattern – which has up to 16 steps, each part or track can have up to 8 patterns – which you can either switch manually or chain, and all the patterns, along with the overall configuration information is stored in sessions – and you can have up to 64 of those. The SL MkIII’s sequencer inherits many of the the Novation Circuit’s sequencer, which is known for its ease of use, and expands on them in a way that doesn’t impede on the ease of use. The basic sequencing unit is a pattern, which can contain up to 16 steps. You can step sequence by holding one of the 16 steps and pressing one or more notes on the keyboard, and the keyboard leds light up to show you which note you’ve sequenced. If you prefer, you can also record your sequence in live, though at least currently as of the first version, notes are quatized to the grid. Once a pattern is in place you can edit the velocity and the gate length of each step, and each note of a step by pressing the Options button. As per live recordingh abot, you can’t currently micro time the start point of a step. If you look at the evolution of the Circuit sequencer, that feature was added later so I wound’t be surprised if we’ll see it here too at some point, but right now it’s not there. Once you have the notes you want in place, you can either play the pattern in sequence – and adjust the overall tempo and swing, or, if the pattern isn’t running, pressing a step will audition its notes. Patterns have quite a few nifty playback features:. You can have a pattern play forwards, backwards, ping pong, or randomly. You can set its start and stop positions to make it shorter than 16 steps. Finally, one of the most interesting and unique features of the SL MkIII is the ability to change the sync rate of a specific pattern. You can set a different sync rate for every one of the 8 patterns in a part. Aside from notes, you can also sequence up to 8 control parameters per track or part. To step sequence a parameter you need to have record enabled while the pattern isn’t playing back, hit the step you want to change, and add the parameter. Hittign the record button while a pattern is playing back lets you motion sequence parameter changes in realtime. You can parameter lock or motion sequence not just the knobs, but any of the pads, faders, pitch and mod wheels and even pedals plugged in the back – within the limits of the 8 total parameter tracks. One level above Step view is the Patterns view, which is a window into 8 patterns in two of the eight parts at a time. You can chain patterns together by holding the first pattern in a chain and then tapping the last one, and then they’ll loop in one long sequence. The Shift-Pattern combo rotates the grid into “Expand” view, which now shows you two patterns at a time, across all 8 parts. One level above patterns are the sessions, which store the entire state of the controller. You can store up to 64 sessions, and change their color using the controls, but renaming them needs to be done with the components software. Hardware control templates are predefined MIDI mappings for all two rows of knobs, pads, faders, soft buttons, mod wheel and pedals connected to the controller. The SL MkIII has 64 such templates which are easily assignable to any of the parts. One you load up a template, the controller is immediately mapped to control your hardware instrument, assuming of course a template for it exists and is mapped properly. There are about 20 tempates included in the current version of the firmware and presumablely the user community will create many more during the product life cycle. Currently you can’t create, change or save templates on the controller itself – you need to use the Novation Components software for that, but once they’re loaded, moving from one to the other is very seamless. The final major feature leg of the SL MkIII is its DAW support, and capabilities may vary somewhat from DAW to DAW. Once you hit the InControl button the entire top part of the controller changes into DAW mode. You’re no longer controlling the sequencer or external hardware, but rather the project that’s active in your DAW. The keyboard mappings remain the same though, based on what you’ve got it set to control. The 8×2 grid lends itself quite nicely to control Ableton Live’s Session view – the grid is a view into the session grid and you can move it any way you want around the grid. The most impressive part of the integration is how you can see the devices parameters on screen. Swapping devices is quite easy – you hit the options button and use the pads to select the different devices, and the encoder knobs automatically map to the active device. One thing you need to wrap your head around is the existence of two clocks, or two sequencer controls – one transport for the internal sequencer, and another for your DAW, when you click InControl. You need to decide if you want to use just one of them, or potentially, if you like, you can use both. I’ve found transport and tempo sync from Ableton to the MkIII to work very well, but the other way around not so much, at least not using the pre-release beta version of the firmware. I’m assuming Novation will work on this in the future, but for now, if tight sync is important to you, either run them separately or have Ableton be the lead. Aside from the three core functions mentioned before, sequencing, hardware templates and DAW support, the SL MkIII has a few more interesting features built in. The built in arpeggiator, can be either always assigned to the active part, or locked to a specific one of the 8 available parts. The arp has its own sync rate, you can latch it, and you can disable steps in the arp patterns to create rhythmic patterns using the pad grid. Of course given one arpeggiator and eight parts total, an obviously wish list feature would be have at least one more… there’s no word from Novation is this is coming or even possible, but one can hope, right? Another nice feature of the SL MkIII is the ability to split the keyboard into zones. By default, the entire keyboard controls one part, or instrument. But, if you activate Zones, you can split the keyboard up and use various portions of it to control different instruments simultainously. Each Zone is color coded to according to what’s assigned to its part, and you have quite a few different controls on a per zone basis. You can split the keyboard any way you like, overlap zones, and choose which zones are impacted by the pitch and mod wheel, as well as pedals connected to the controller. You can connect up to three pedals to the SL MkIII so there’s quite a selection there. The SL MkIII also supports scale modes which let you either use the lights as guides for the various scales, or snap notes to one of quite a few scales and transpositions, or ignore notes that aren’t part of the selected scale. I’ll start with the cons – I haven’t found much fault with the hardware – it feels very solid. There are 49 and 61 key versions of the SL MkIII – personally I would prefer a smaller version. There are smaller versions of Novation’s other keyboards, so one would think that a smaller version might come at some point in the future but I’ve not received any indication of that from Novation when asked. My personal request is that if they do create a smaller version, please make one with minikeys so that we get a bit more notes than just two octaves. On the firmware side, you might have other wish list features than me, but if my wishlist were to be considered here are things I’d like to see that aren’t currently here: The ability to transpose sequences, MIDI learn so that we can create templates on the controller itself rather than on a computer, and the ability to rename sessions and templates on the controller rather then just on the components software. I’d also like to see non quantized live recording and the ability to micro-time step start points. Finally, in terms of DAW control, and I’m not sure it’s possible in terms of what Ableton allows third party vendors to do, it would be great to see the mixer levels right on screen, not to mention, since we have a high res screen, more Push 2 like features, like for example the ability slice samples on the controller. 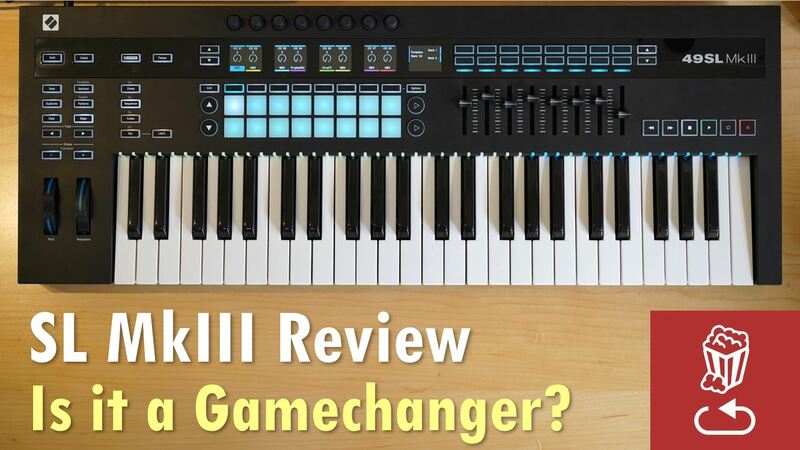 Pros are quite obvious and stated throughout this article – if you want a combo sequencer, hardware and DAW controller, the SL MkIII is the only game in town, and quite a good one at that. The sequencer is powerful and yet easy to use, the hardware templates support plentiful and seamless and DAW control with the onboard screens intuitive and fast. As you consider whether the new SL is for you, also take a look at Native Instruments Komplete Kontrol, Arturia Keylab and Ableton’s Push 2. A detailed comparison is outside the scope of this video, but in general, they each offer a tighter integration with their respective software suites and sound libraries, but on the other hand don’t have the standalone hardware sequencing and hardware templates that the SL MkIII does. In summary, if you’re looking for a controller that can handle a hybrid setup with both hardware electronic instruments and your DAW in once central place, the SL MkIII does indeed change the game for controllers, and sets a new benchmark by which future controllers will be judged. The MkIII is a bold statement about what a controller can do, and should be a serious contender if you’re considering a new control keyboard. Yes it is possible to overlap zones. You can make multiple layers. It would be nice to improve the sequencer, to allow the transpose function, and to enable/disable steps, like on the arpeggiator. Skip, tie and ratchet functions would be also nice. How easy would it be to integrate an iPad with this controller – sort of like an external synth (obviously the iPad can do much more)? Absolutely awesome review and video, just watched it. Came home from a gig and my VMK188+ is too heavy, size-wise an 88 bed is no prob but aiming for a 61 keys board. A tie between this beast and the new A-series from NI. I have 3 parameters: key feel, usability and fast smart production and lastly portability. What I like about the NI A-series is the 3rd party support from Arturia, U-he and that I can control these synths presets and scroll through them and preview sounds, this is the main Pros of this one. Is this available with the instrument control in the SL mk3? For the 61 Version I like very much all the new features you can do and also the productivity pluses with the scales, arp, the assign-key-to-know and quickly make a chord and play around with the buttons, also feels you can create a song quickly with that and also the Zones if you use 3-5 synths and sounds only – can you fast-replace a zone if you’re “done” with let’s say the Bass and wanna record something new in that zone and keep the others? I want it for a live thing plus extra is the usability and studio functionality for me so the cool features is a bonus. Which one would you recommend? More for the buck with the SL mk3 or NI-Aseries?